Xiaomi launched its flagship Mi 4 smartphone at a glitzy event in Beijing, where the Chinese budget handset maker’s chief executive sought to challenge larger U.S. rival Apple Inc.The Mi 4 comes as budget handset makers in China are competing more aggressively on price and generous features, with even high-end manufacturers feeling the pressure.South Korea’s Samsung Electronics Ltd said this month that its disappointing smartphone shipments were due to poor sales in China, which had 1.27 billion mobile subscribers in June.Dressed in a black T-shirt and blue jeans, Xiaomi CEO Lei Jun took aim repeatedly at iPhone maker Apple during the presentation on Tuesday, comparing the design and manufacturing process of his new 4G handset to the U.S. firm’s more expensive offerings. “Our product really is better than the iPhone,” said Lei. Apple, which was due to announce second-quarter earnings later on Tuesday, was not immediately available to comment. 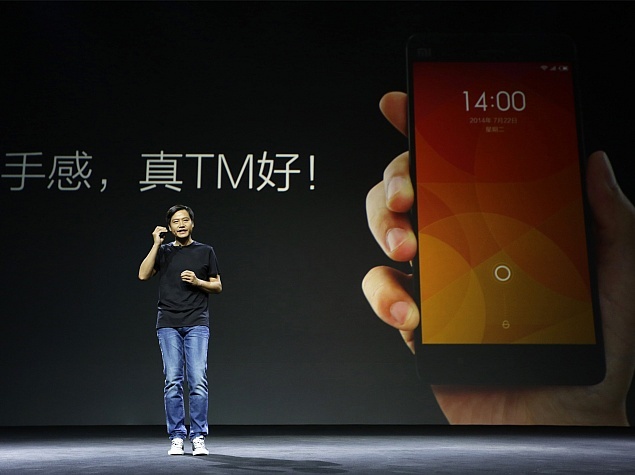 The forthright Jun spent nearly an hour on stage describing the Mi 4 phone’s construction – particularly its beveled metal rim whose similarity with Apple’s phones drew murmurs of “iPhone” from the journalists at the event. The Mi 4, which goes on sale July 29 for 1999 yuan ($320), has a 5 inch, 1080p screen and a Qualcomm Inc Snapdragon 801 2.5GHz processor. An equivalent iPhone 5s costs $650. Analyst Neil Shah at technology consultant Counterpoint said that while Xiaomi was gaining swiftly in emerging markets, it did not pose a real threat to Apple just yet. “Right now it’s more a big talk rather than real threat to Apple,” said Shah. “In emerging markets they are growing in leap and bounds, attracting buyers who aspire to Apple but they can’t afford to buy Apple. Founded in 2010 by Lei and seven others, Xiaomi seeks to cut costs by eschewing brick-and-mortar stores in favor of web-based distribution and word-of-mouth marketing. Xiaomi became the world’s sixth-largest smartphone vendor in the first quarter of 2014, according to data firm Canalys, after repeatedly doubling its sales. The company was valued at $10 billion last year, drawing industry speculation that the fast-rising company could threaten Apple and Samsung, which dominate the premium market. Xiaomi sold 18.7 million smartphones in 2013 and on Tuesday maintained a 60 million sales target for 2014. For comparison, Huawei Technologies Co Ltd has said it is targeting 80 million smartphone sales for the year.